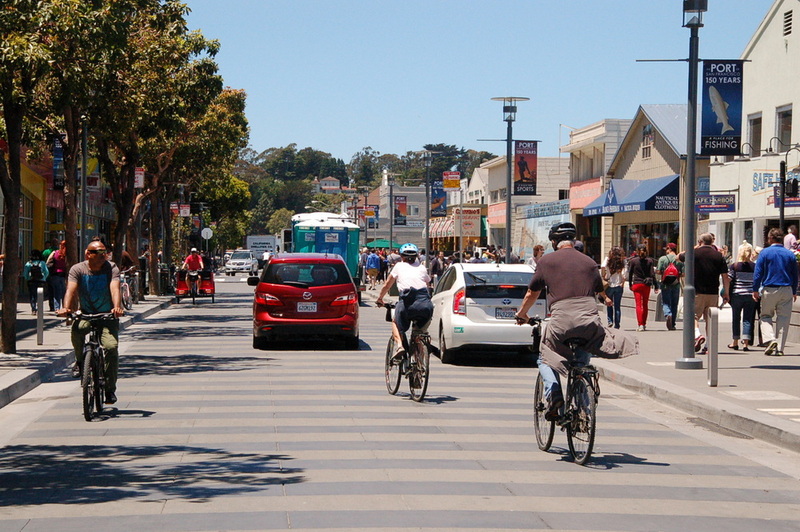 Two blocks of Jefferson Street in Fisherman’s Wharf have been revamped to prioritize walking and biking after the project was expedited with support from political leaders. Car traffic on Jefferson between Hyde and Jones Streets has been tamed, with formerly one-way traffic now running two-way. Sidewalks were expanded with new planters and seating, on-street parking was removed, and the asphalt roadway was replaced with a surface designed for slower speeds. Altogether, the street has been re-designed to send the message that people come first, not cars. City officials and community leaders at a ribbon-cutting ceremony today touted the revamp — the first phase of streetscape plans for Jefferson — as an example of how well city agencies can coordinate when politicians put their support behind a project. City leaders largely credited the mayor for expediting the Jefferson improvements to finish in time for the America’s Cup races this summer. 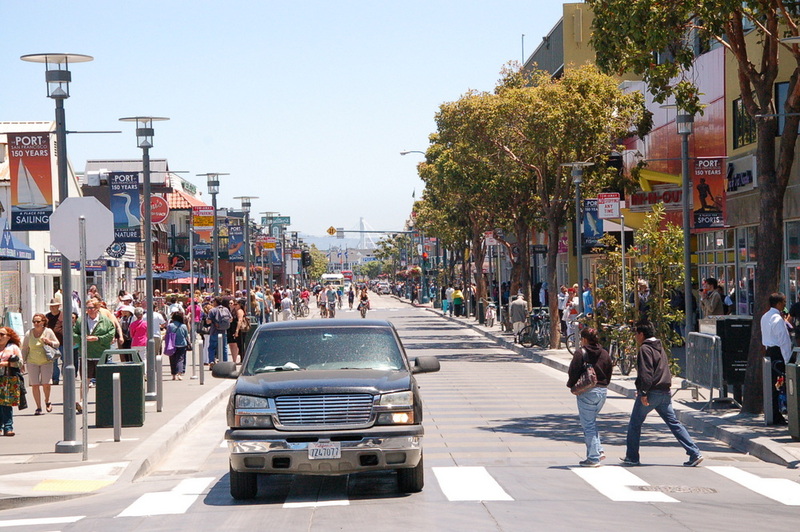 “The mayor’s leadership is the only reason, to some degree, that we’re actually here today, opening up a brand new street,” said David Berbey, president of the Fisherman’s Wharf Community Benefit District. Officials also gave much credit to Neil Hrushowy, the Planning Department’s project leader, for his efforts at community outreach and spearheading the often difficult process of creating a design that accommodated demands from various interests. One change that was made to address merchants’ concerns was the addition of curbs, since the original proposal called for a pedestrianized, curbless street where drivers were expected to share space with pedestrians. 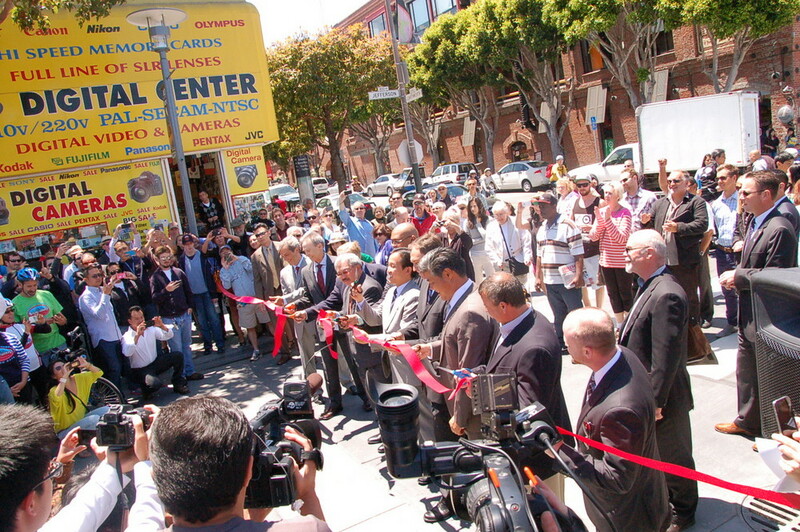 City officials make the new street opening official. An early champion for improvements on Jefferson was Rodney Fong, president of both the Wax Museum and the SF Planning Commission. 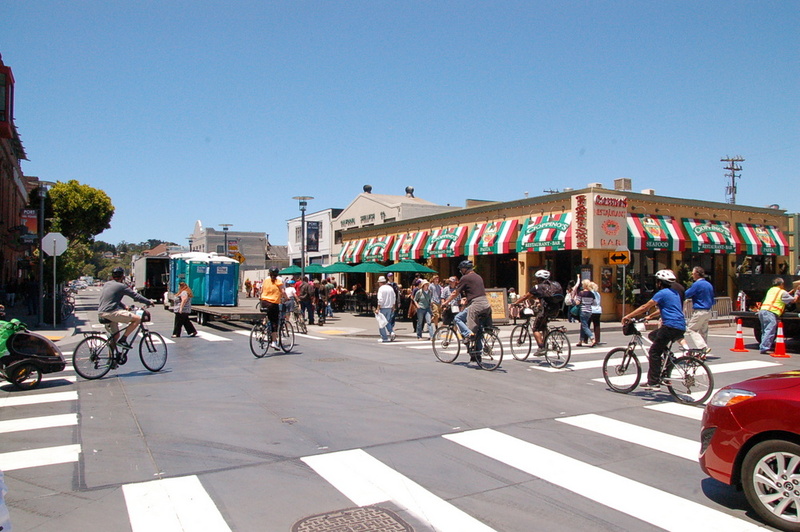 Six years ago, when he was also president of the Fisherman’s Wharf CBD, he spearheaded a survey asking visitors what they liked and disliked about the area. 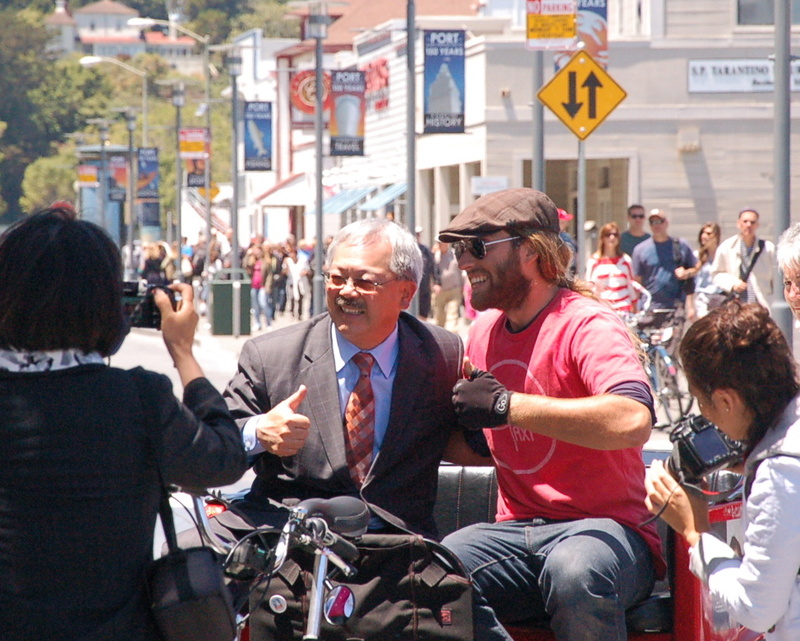 “The number one thing they liked the least was overcrowding,” Fong told Streetsblog. Fong noted that removing the street’s parking made a lot of sense, since new signs should help guide drivers toward the thousands of underutilized spaces in nearby parking garages. The northernmost block of Hyde Street was also converted for two-way traffic. The mayor doesn't miss a photo op. This should be a great improvement to the bike route between the Ferry Building and the Marina. 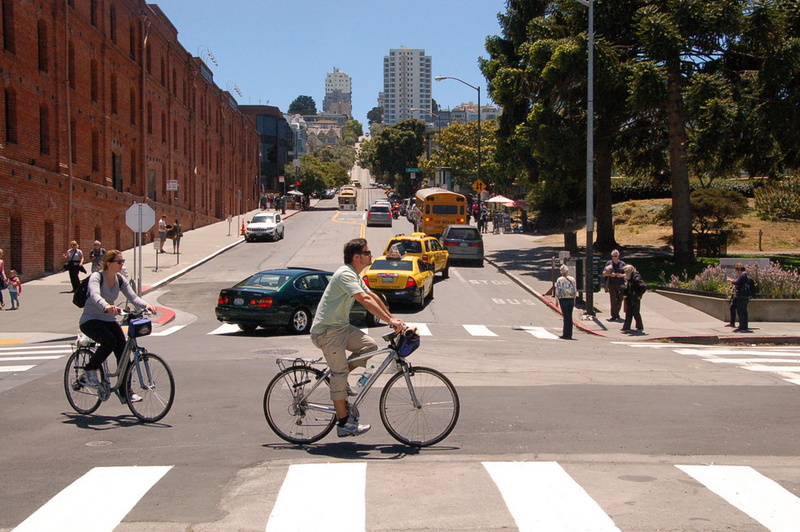 No more dealing with that dangerous left turn from the Embarcadero to North Point. It’s great to see this finally opening and see a street that is geared for all, not 90% for cars. One question: The article notes: “One change that was made to address merchants’ concerns was the addition of curbs..” What were merchants concerns with removing curbs? Why would they care, or are they concerned cars would plow into their businesses without onstreet parking to protect them just like folks thought parklets would be dangerous for the same reasons? I’m sure there’s an explanation that I’m not thinking of. Maybe it’s really the SFFD’s obsession with 20′ right of ways. Enough griping. Love the pavement – will have to go down and check it out. I wish they’d close off Jefferson St. for cars in the afternoon/evenings. You see this in some European cities in areas with high ped traffic. It’s really the best of both worlds because businesses still get deliveries in the morning, and most pedestrians won’t have to contend with car traffic. Looking forward to a fail ban on cars this summer. A great example is market and 9th being ‘closed’ to private autos. They only obey the sign when enforcement directed them they need to turn and not barrel down straight along the muni tracks. I still think this is a failure considering how we know so much about peds/cyclists work in a high volume commerical section. It should be closed off to cars and only opened to delivery trucks/vans in the mornings and evenings. Another failed project. When you have a steady of cars coming through in both directions, this is just another auto-centric street. Sad. Rode it last week eastbound – very nice! I do like the idea of closing the street regularly for pedestrians to use – preferably with removable bollards or some removable barrier in the roadway. Still very doable with these changes.